In the last few years, tech has begun to carve out an increasingly large presence at Fashion Week, and this year marks an unprecedented degree of involvement from both tech companies and designers. In 2009, Alexander McQueen live streamed his Spring/Summer 2010 show through SHOWstudio. Then came Marc Jacobs, Emporio Armani, and Dolce & Gabbana for Fall/Winter 2010. Today, Mercedes-Benz Fashion Week has a live stream trained in on all of its shows. Gone are the days of dressing in all black and pretending to be a PR assistant to get into the tents. As I write this, there is a camera panning around the Nicholas K show as the seats slowly fill up. Diane von Furstenberg just sent out an email blast telling us we can watch her September 8 show on Facebook. Facebook! It’s democratization, and it’s also excellent advertising. Fashion voyeurs, here are your resources for getting in on the action from afar. Open a window on your computer and let it roll. As a consumer, a universal live stream is a major upgrade from having to wait around for images and video to load on Style.com. On the flip side, it raises further questions about the necessity of editors attending shows, the schedule for which has become increasingly packed and unrealistic. On a personal note, I’m still looking for bars in New York that are showing the stream, so if you know of one, please leave a comment below. Pinterest has launched a Fashion Week hub featuring boards from magazines, designers, beauty companies and models. The images are a combination of professional shots and behind-the-scenes snaps. If you’re going to be pinning, it’s a well-organized catalogue from which to pull. Fashion insiders are again donning Google Glass this season to give viewers a first-hand look at their world, which is, if you think about it, a truly good use of the tool. Following on the heels of von Furstenberg, who wore a pair and put them on her models last year, Nina Garcia is providing an editor’s-eye (and front-row) view of the action for Marie Claire (#benina). 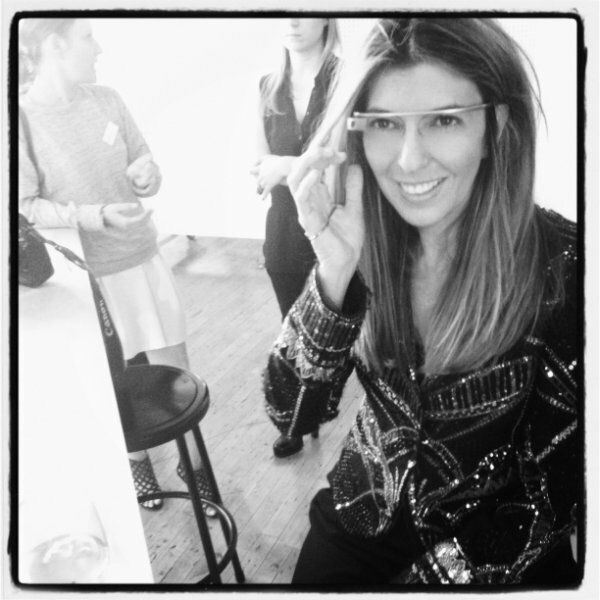 Netrobe is also releasing Google Glass videos on their blog taken by the blogger Style Heroine. Since not every makeup artist, designer, and editor is going to be wearing Google Glass, Instagram is in some ways as backstage as you can get. Plug in #NYFW, or some iteration thereof (#MBFW, #SS14), and have at it. Into the Gloss shared some great recs when it comes to models, photogs, and stylists who will undoubtedly be making some especially pretty pictures for the next month. Call it Fashion Week blogger tech art, sponsored by Sony. According to Mashable, Tumblr has paired 20 New York-based bloggers with 18 designers and two organizations for “apprenticeships” in the two weeks leading up to Fashion Week. Miguel Yatco of Living in the Stills with Oscar de la Renta and Sara Zucker with Anna Sui, for instance. The exhibit, which opens tonight at Milk Studios and runs through the week, is the result of those partnerships. Since it’s Tumblr, odds are the work will take the form of photos and GIFs.